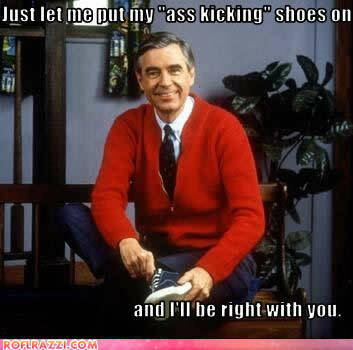 Chuckling: Over another way to remember Mister Rogers. Wondering: Just how evil the Girl Scouts really are. Contemplating: The paradox of satisfaction, and how it may be harder to be satisfied in a world that is producing an increasing amount of “good stuff.” The forecast is for a world in which we have access to all information but services (Amazon, Google, whoever) provide recommendations for us. What do you think? Also contemplating: The Filter Bubble, in which Eli Pariser notes that the world we see is increasingly (and alarmingly) shaped by filters (again, Amazon, Google, whoever) that determine what we see (or don’t) based on assumptions and predictions (in turn based on Internet habits) about us. Want to pop your bubble? Here’s how to start. I haven’t read that, Chris, but it sounds interesting. I’ve encountered a similar theory in anthropology—how language shapes the way we see the world and vice versa, particularly where time and direction are involved. Mr. Rogers may seem goofy and plodding (I’m OK with that) to the older set but to a child it turns out it is just the right speed. Q saw Mr. R for the first time a couple of months ago. She was 4 or 5. She loved it. LOVED it. I was surprised, but he holds up to the test of time. @Evelin: I agree with you. I am really sorry to see him (and his slow-paced show) replaced on most PBS stations with marketing-driven, choppily edited pabulum. Blech.